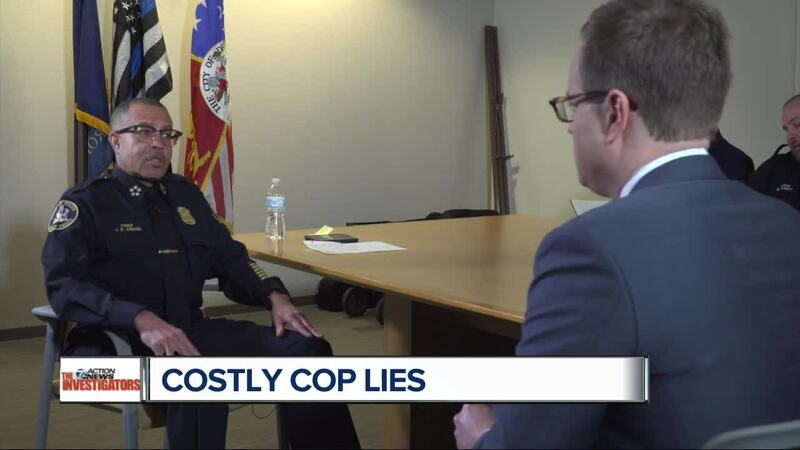 DETROIT (WXYZ) — Suspected criminals have gone uncharged in Detroit, not because prosecutors didn’t believe a crime had been committed, but because the officers involved in the case had a history of lying, 7 Action News has learned. The revelation comes after an October directive issued by Chief James Craig, telling officers that if they lie, they’ll be terminated. Since 2015, internal affairs probes found that at least 10 Detroit police officers made false statements on the job. Last year, DPD helped build a weapons case against a known violent gang member. The U.S. Attorney’s Office was ready to bring charges, Craig said, until they found out that the officer involved in his arrest had a history of giving false statements. “Because of his history of a false statement, that person couldn’t testify,” Craig said. The case was dropped and the man went uncharged. Because he didn’t face a formal charge, Detroit police refused to release his name. A spokeswoman for Wayne County Prosecutor Kym Worthy confirms that her office, too, has not proceeded with some criminal cases because of an officer’s untruthfulness. Any officer with a history of lying, no matter how minor, is relevant to any criminal case they bring, Diehl said. Court rules require that any information that can be used to impeach a witness’s credibility—including past lies—need to be disclosed to opposing attorneys. 7 Action News attempted repeatedly to determine the number of officers currently on the force with sustained allegations of false statements, but city officials said the cost to do so would be thousands of dollars. With some officers serving decades on the force, personnel records and disciplinary histories would need to be retrieved from off-site storage locations and read by hand, said DPD Attorney Grant Ha. Officials were able to more readily report that 10 officers since 2015 have had sustained findings of making untruthful statements during the course of their police work. Officer Latoya Chavies, according to DPD records, was found to have punched her daughter several times in the face and body. An internal probe concluded she lied to investigators about it. DPD says Officer Walied Kamel lied about roughing up a citizen, telling internal affairs he didn’t use force. An investigation found that she actually did. Officer Kathryn Vaughn lied, according to DPD, when she was asked to give backup to two units on police runs. Efforts to reach Officers Chavies, Kamel and Vaughn through the police union for comment were unsuccessful. Instead, Vaughn told them her vehicle was “out of service” and she needed to “fuel the scout car.” In truth, the car had plenty of gas. Vaughn doubled-down on the lie when she submitted a false activity log, according to DPD. In November, the Detroit Police Officers Association pushed back against Craig’s memo, filing an unfair labor practices complaint against the department after Craig announced that cops who lie will be fired. There hasn’t yet been a hearing on the complaint, but Craig says he plans to fight it. The new directive won’t apply retroactively.